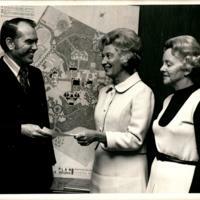 Subject is exactly "College presidents"
Mrs. Thelma Brennan and Mrs. Wayne present President Lambuth Clarke with what is believed to be a check from the 1972 Women of Wesleyan Flea Market. 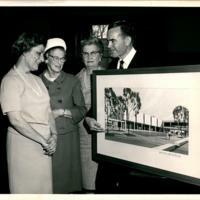 The flea market served as a fundraising initiative for the college. 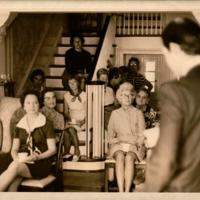 Women of Wesleyan seated, some with cups in hand, as a speaker, likely Virginia Wesleyan President Lambuth M. Clarke, gives an address. 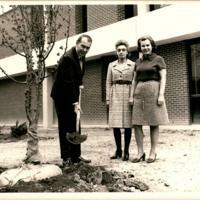 In the company of two Women of Wesleyan members, President Clarke shovels soil on a newly planted tree on the Virginia Wesleyan campus. 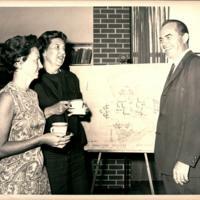 Standing in front of a campus drawing, President Clarke speaks to two women holding teacups at one of the early fundraising coffees. 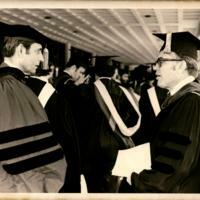 President Lambuth Clarke speaking to Dr. Norman A. Graebnor, University of Virginia historian and commencement speaker, at the 1973 Virginia Wesleyan College commencement ceremony. 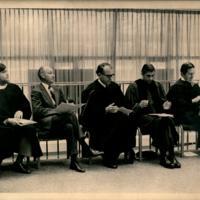 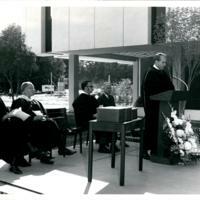 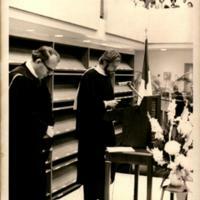 President Lambuth Clarke standing next to William F. "Biff" Morris, class of "73, as he was delivering the benediction in Hofheimer Library at the 1973 Virginia Wesleyan College commencement ceremony. 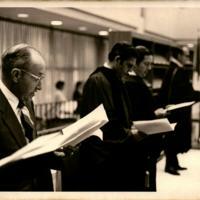 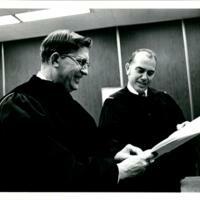 U. S. Senator William B. Spong (left) with President Lambuth Clarke (right) examining a document at the 1972 Virginia Wesleyan College commencement ceremony. 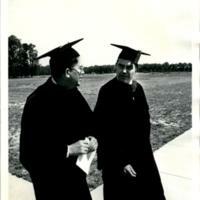 U. S. Senator and Virginia Wesleyan College commencement speaker, William B. Spong (left), walking with President Lambuth Clarke (right) at the 1972 commencement ceremony. 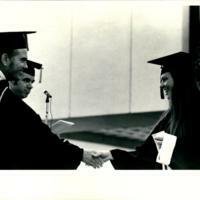 Left to right: President Lambuth M. Clarke, Dr. Stephen S. Mansfield, and Mrs. Harolyn Moreland Torrence on the platform at the 1971 Virginia Wesleyan College commencement ceremony. 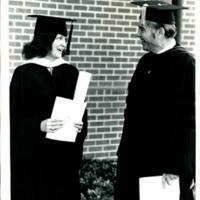 President Lambuth M. Clarke and graduating student, Mrs. Amanda Venner Williams at the 1971 Virginia Wesleyan College commencement ceremony. 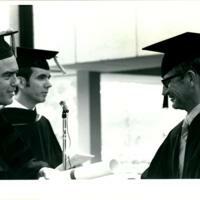 Left to right: President Lambuth M. Clarke, Dr. Stephen S. Mansfield and graduating student, Robert Irwin Johnson, on the platform at the 1971 Virginia Wesleyan College commencement ceremony. 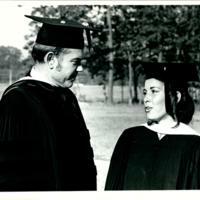 Graduating student, Mrs. Judith Pugh Brooks and President Lambuth M. Clarke interacting at the 1971 Virginia Wesleyan College commencement ceremony. 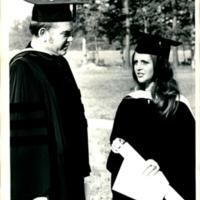 President Lambuth M. Clarke and graduating student, Miss Carla Cathy Castor, at the 1971 Virginia Wesleyan College commencement ceremony. 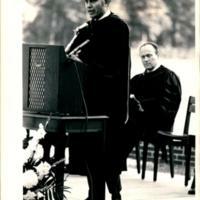 President Lambuth M. Clarke speaking at the 1971 Virginia Wesleyan College commencement ceremony. 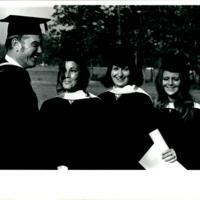 From left to right: President Lambuth M. Clarke, Mrs. Amanda Venner Williams, Mrs. Judith Pugh Brooks, and Miss Clara Cathy Castor at the 1971 Virginia Wesleyan College commencement ceremony. 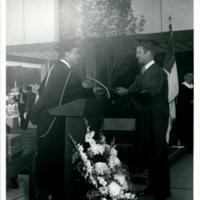 Dennie E. Allen shakes hands with President Lambuth Clarke as he receives his diploma at the 1970 Virginia Wesleyan College commencement ceremony.